I finished my blog last night around 2am (local time). I still couldn’t sleep, while to my right and left, Nancy and the kids slept just fine. 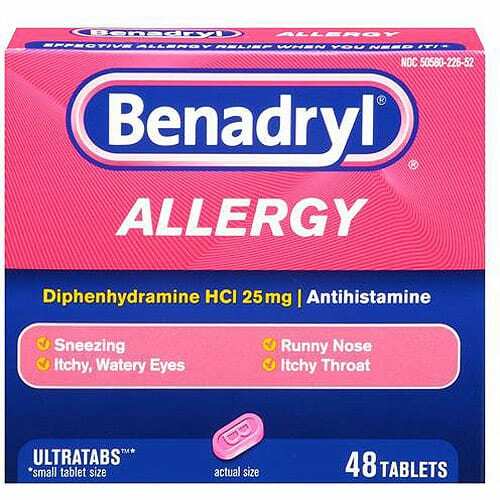 At 3:30am, I got up and looked for Benadryl hoping it will make me drowsy and push me to sleep. It didn’t kick in right away. I must’ve fallen asleep close to 4:30am. 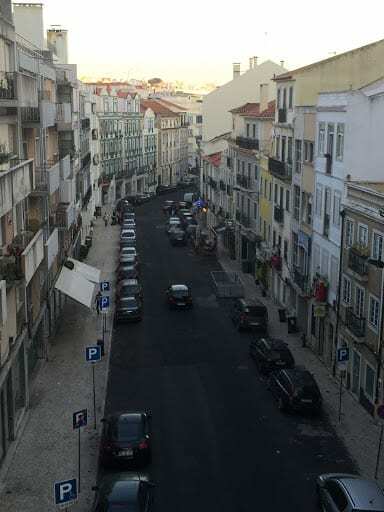 I planned on getting up early since today was our first day to truly explore Lisbon. But it just didn’t work out that way. By 7am, Nancy was already up so she and Caitlin got ready, showered, dressed for the day and they walked down to the lobby for breakfast. I got up around 8:30am, and by 9am I made my way down for the free breakfast, a perk for being a Hilton Honors Gold member. It wasn’t until 10am when we finally got out of the hotel. transportation or route options (with links to Google Maps). It also tells you how to get from one attraction to another (on foot or via bus, car, or train), and the time to expect to go in between attractions. 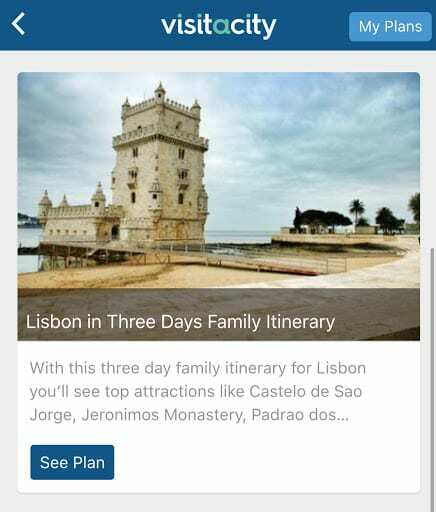 So there, that’s why it served as a free tour guide for us today, and will most likely be our app of choice for our nearly 3 weeks in Europe. We decided to go with the Family Attractions Itinerary. 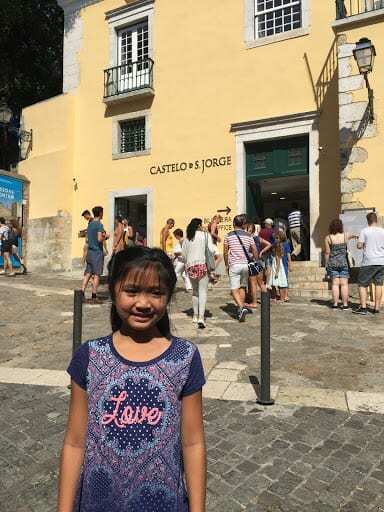 Our first stop was at Castelo Sao Jorge or St. George’s Castle. To get there, we took an Uber. The Uber driver came to the hotel within 3 minutes. So let’s pause for a moment. Why did we use Uber vs. public transportation. Uber in this case was more cost effective. The cost for each ride using a bus, tram, subway/Metro was $1.40 Euro per person. So when you factor in the 4 of us, that’s about $6 USD altogether. This Uber ride to the castle was a whopping $3.34 USD…plus it was a door to door service. So in this case, Uber won. It took 10-15 minutes to get to the castle. No traffic or anything. You can tell that it’s a major attraction. For a moment, it looked like everyone was headed to the castle. The streets were narrow, but it was an organized chaos. We made it to the castle in one piece. 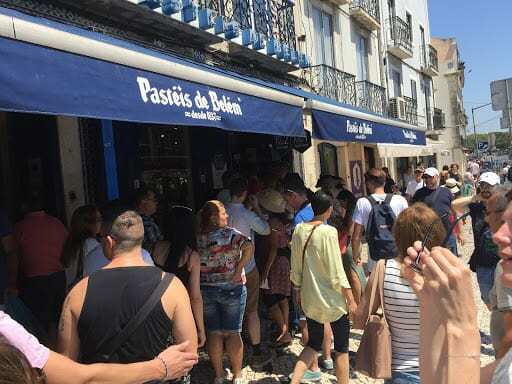 First activity in order, stopped for Nata, Pastel De Nata right outside the castle. This shall be a daily morning tradition while we’re in Lisbon. I coupled that activity with a shot of espresso. Aaaahhh….good late morning! We picked up tickets to the Castle at the Main Entrance, there was a line, but we got our tickets within 5 minutes. The kids were free…yay! Free is good! 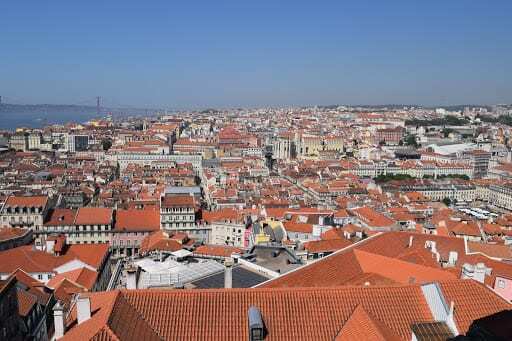 Once we entered, it was a moment where we got to see a panoramic view of Lisbon and its famous rooftops. We took dozens of pictures and watched in admiration. 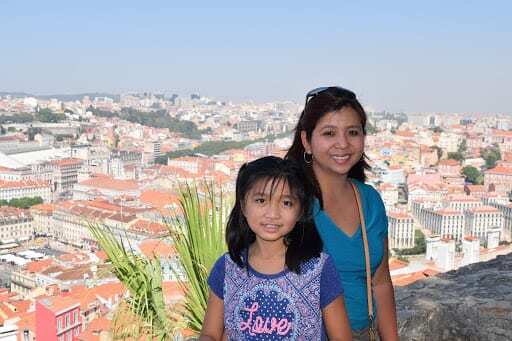 Visit A City also gave us highlights of Castle, in a nutshell, it’s a large Medieval castle complex with archaeological ruins, museum and gardens. 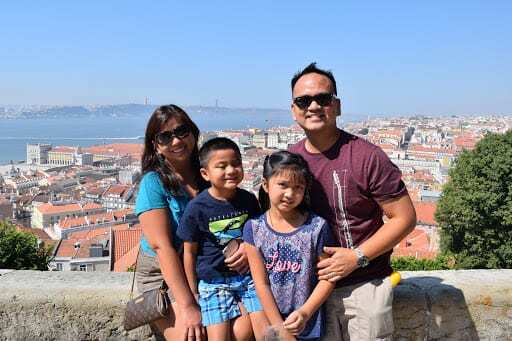 The site visit allowed us to walk the expansive grounds where we walked up and down these narrow steps where we saw different vantage points of Lisbon. I broke out a sweat. It must’ve been in the 80s or 90s already when we walked around. 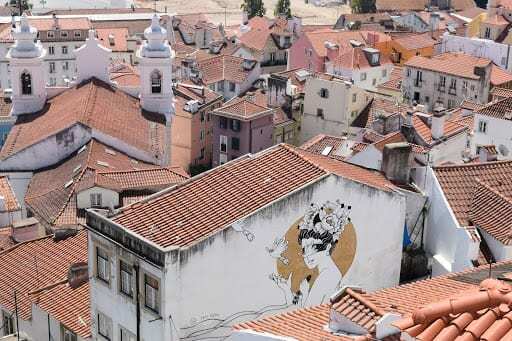 We left the castle and walked down Alfama, known for its narrow streets and as the oldest district of Lisbon. We walked through old homes, and some of them have been used as restaurants. We were on the hillside and we were thankful that we did this tour walking down. 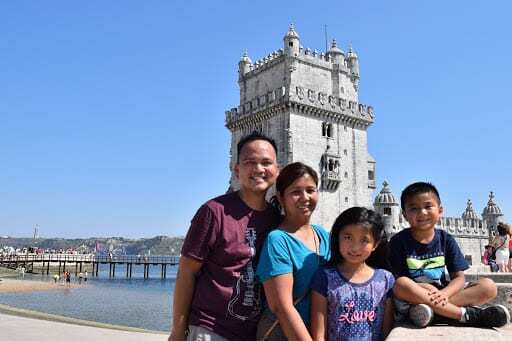 We found ourselves on the main drag and we decided to, without a plan, to just wander aimlessly in Lisbon. I said let’s just keep walking, get lost, and somehow find ourselves somewhere unknown. So we did, we kept walking and found ourselves at the nearest funicular or tram stops. 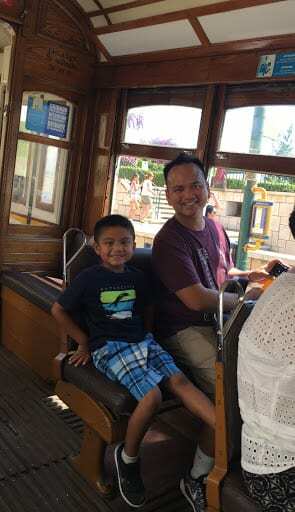 We got on the tram. We used our green transportation card, Viva Viagem, to pay for our ride. We didn’t know where we were headed. But we used this time to just sightsee. It was a good decision, it allowed us to relax, and appreciate the transportation system. 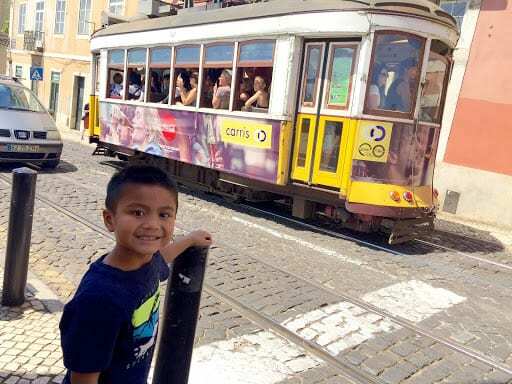 The tram went up and down the streets of Lisbon. Not sure how long we rode the tram, 20 minutes perhaps. We ended up finding ourselves in a main square, lots of stores, shops, and restaurants. 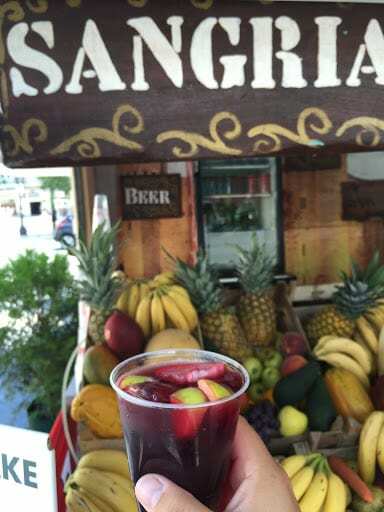 while I tried a local ice cold sangria, refreshing!!! 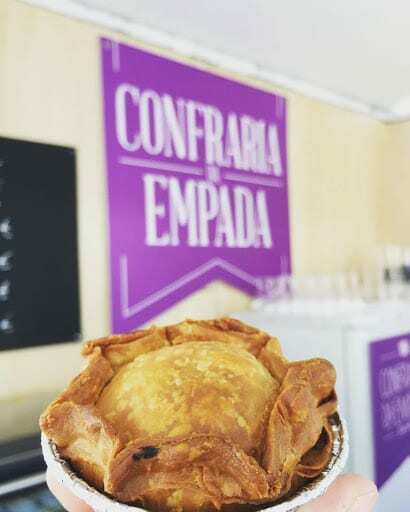 Next door gave us a taste of Galinha Empada or chicken pie. Evan and I shared this little pie – little chunks of chicken, so flavorful. I especially loved the crust, so flaky. Ok, it’s time to get our tourist gear back on track. I checked my Visit A City app. 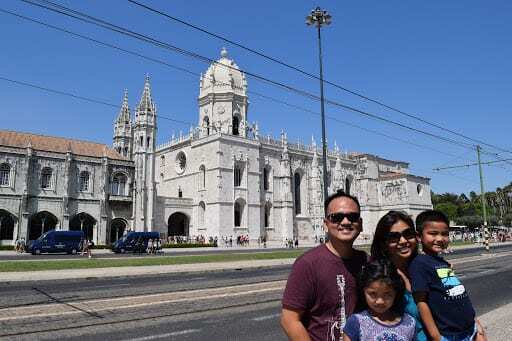 From where we were, took bus 714 and headed down to Belem. We used the Viva Viagem again, so convenient. 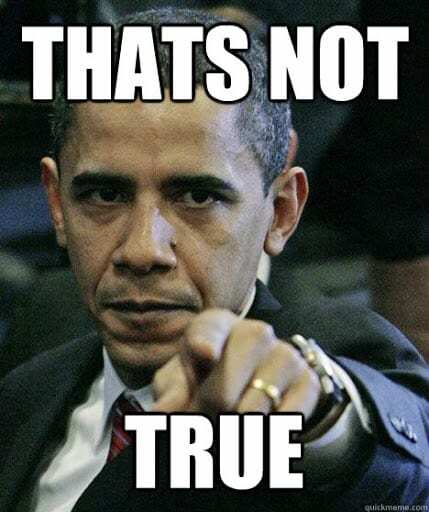 The bus was so comfortable, it was also air-conditioned. There were quite a few stops but were in no hurry. It’s a trifecta of a visit. 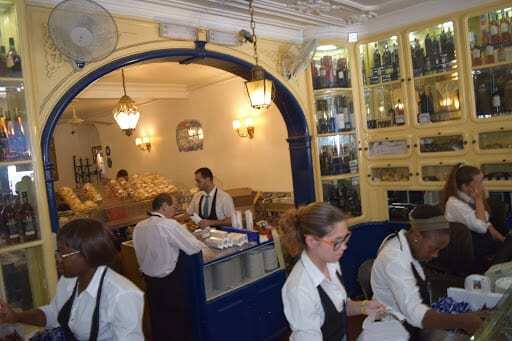 First stop, Pasteis de Belem. 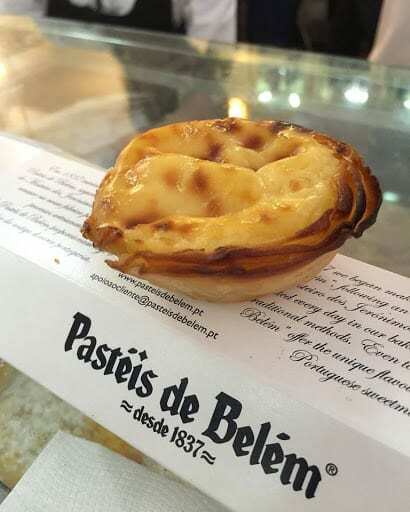 When I heard that Lisbon is known for their Pastel De Nata, well, Pasteis de Belem was like the Holy Grail of Pastel de Natas. Throngs flocked outside like a pilgrimage. I didn’t know how long I’d be waiting. But I must’ve gotten lucky. I was in and out of there within 10 minutes. These egg tarts were super creamy. The shell or crust was crunchy. Best part it was served hot out of the oven. 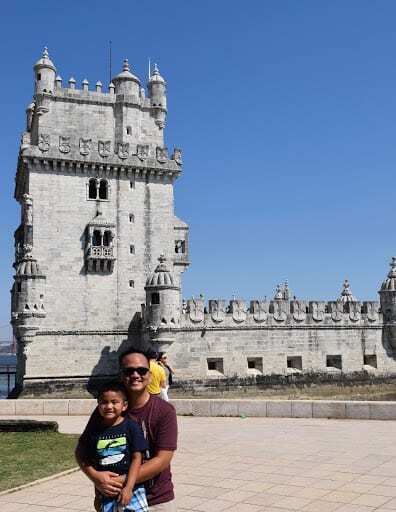 It was a perfect pit stop to before we hit the Belem area. the way. 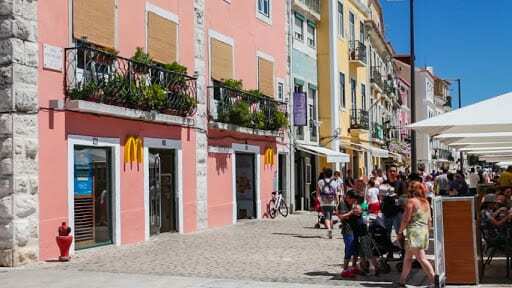 After leaving Pasteis de Belem, we walked across the street for its other top attaction – McDonald’s. I knew our visit to Europe would be different with Caitlin and Evan. 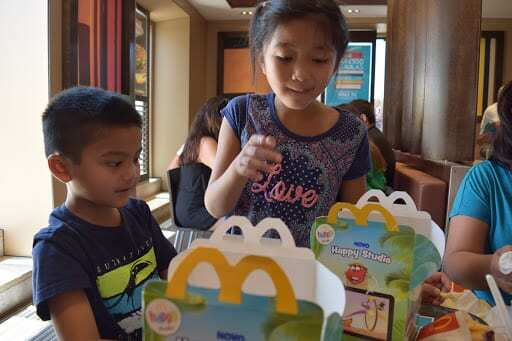 We stopped to get them a couple of Happy Meals. No chicken nuggets here, instead, they have real chicken wings which I loved. This is what they wanted to eat, and we had to keep them happy. I think we accomplished that. After leaving McD’s we walked to the nearby park to cool off, and for Cait and Evee to play around for a bit. I people-watched. It was a gorgeous, but definitely warm day and we took refuge by sitting under a shady tree. 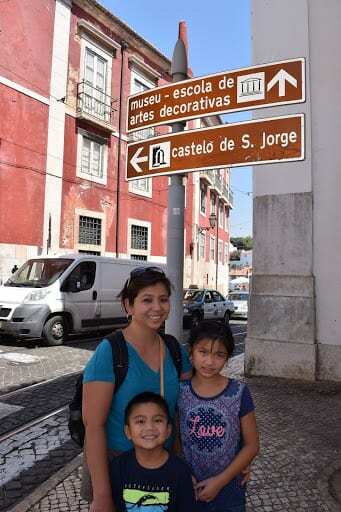 Next on the list from Visit A City was a skip and a hop from Pasteis de Belem, McD’s, and the park. 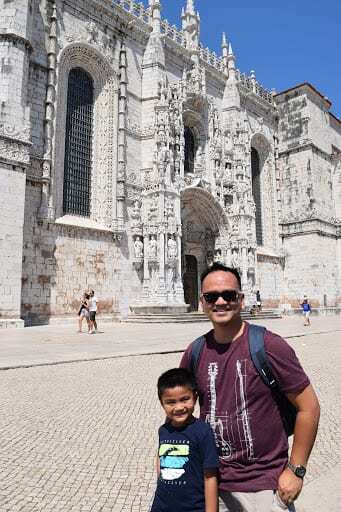 It was Monastery of Jerónimos – Mosteiro dos Jerónimos, a gorgeous structure from the outside. It was hard not admire the architecture. We knew that Evan and Caitlin would not last long inside the museum, so we opted to go inside the church and admired its gothic architecture. I watched this last week on Rick Steve’s TV show. 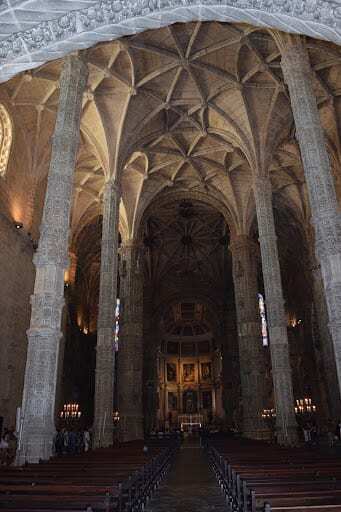 According to GoLisbon.com, “the cloisters are magnificent, each column differently carved with coils of rope, sea monsters, coral, and other sea motifs evocative of that time of world exploration at sea. 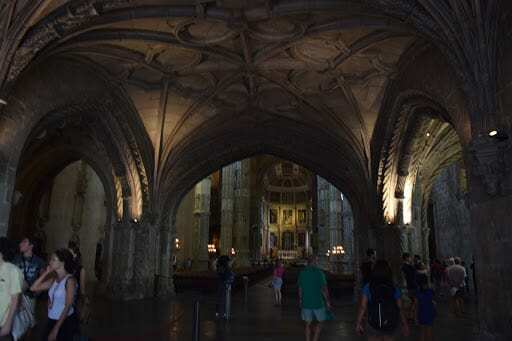 Here is also the entrance to the former refectory that has beautiful reticulated vaulting and tile decoration on the walls depicting the Biblical story of Joseph. I was awestruck that I had to document this visit using Facebook Live. It was that gorgeous. 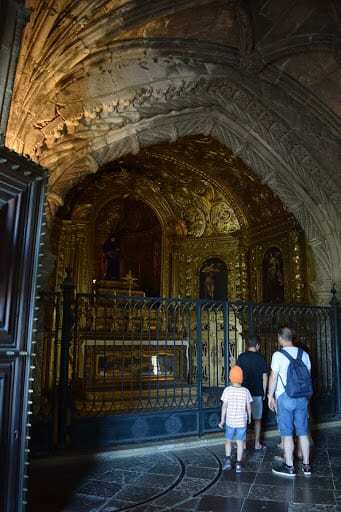 After leaving the Monastery, it was a 10-minute walk to Padrão dos Descobrimentos. However, this monument was under restoration, bummer! 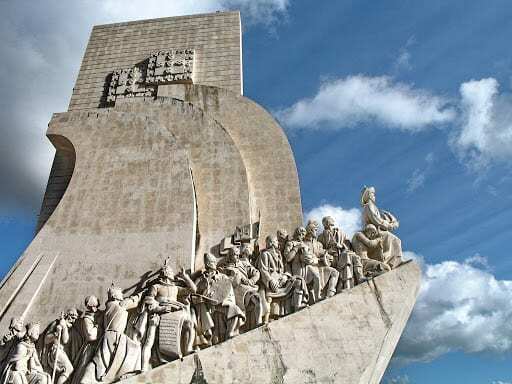 According to Visit A City, “dedicated to the 15th to 16th century Age of Discovery when Portuguese explorers set out across the oceans to seek the New World. It was from this point where the ships would set sail to far off destinations like India and the Far East.” I wish I saw it in its full splendor, maybe when I return in the future. checked my phone and looked at ways to get home. Trains and buses would mean more walking in between stations and around 48 mins altogether. Or, we could take Uber and be home within 19 minutes. Time was of the essence. We took Uber. We were quoted between $11-$15 USD. We waited for 5 minutes. Xana, our driver, arrived on time. Her car was clean, and the A/C was all set and ready to cool us down. Unlike our driver earlier today, Xana spoke English quite well. She talked a bit about their history, pointed some historical landmarks along the way, all in all, made us very comfortable. Uber won again. We were so pleased with our ride home, we handed her a tip, and she respectfully refused and said it wasn’t necessary. In return, I rated her very highly! Thank you, Xana! We made it back to the hotel close to 5pm. It was great to come back to our room and it was all made-up. Nancy took a nap, Evan and Cait took a quick shower, I recharged the electronics and rested as well. By 6:30pm, we were refreshed enough to go out to dinner. feast. I did a transportation decision again. 17 minutes will include13 minutes of walking and 4 minutes inside a bus for around $6 Euros. Or, we could Uber and pay for $2-4 Euros and be at the restaurant in 6 minutes. Hmmmmmm….Uber won again! Tiago, our driver, was prompt. He also spoke English quite well. 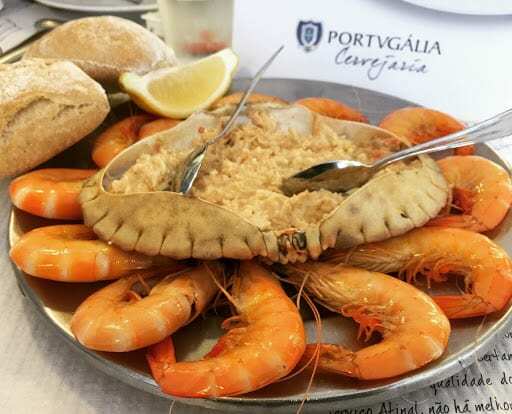 He said that he also would recommend Cervejaria Ramiro, and on our way there, he also pointed out another local seafood fave, Portugalia. We made it to Cervejaria Ramiro but as luck would have it, the restaurant was closed. Grrrrr…..so Tiago suggested Portugalia, and that’s how we ended at Portugalia. Our Uber-ride was $5 overall….money well spent. Finally, it’s dinner time. It was already around 7 when we got to Portugalia. It wasn’t crowded when we arrived, but by the time we placed our orders, that’s when the crowd started to build up. 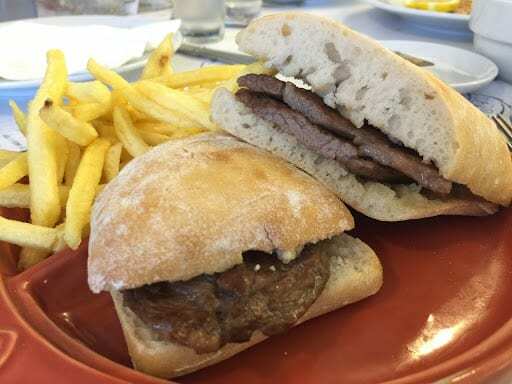 One thing to remember about dining in Portugal. 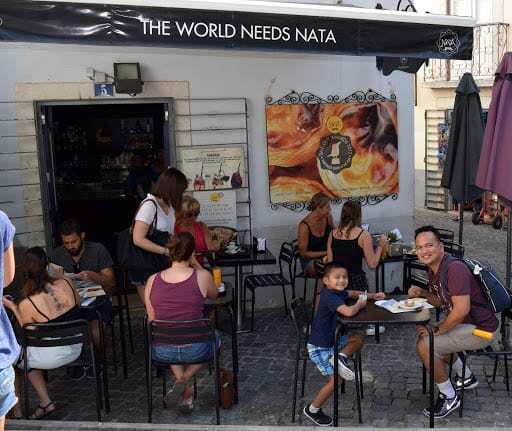 Just like the US, they will serve all these pre-meal items such as bread, olives, cheese, etc….well, unlike the US, those are typically included with your meal. Not in Portugal. If you touch it, you pay for it. If you don’t touch it, they’ll take it away and won’t charge you. Evan happened to love bread, so we all had the bread…but the rest, we didn’t touch them and waited for our meal instead. We ordered Beira Mar seafood platters (shrimp and crab stuffing), shrimp soup, steak sandwich with fries, and pork chops and rice. Another delicious dinner. The highlight for the adults? The succulent shrimp…so sweet, so fresh. It didn’t need much help. Just fresh lemon juice did the trick for me. 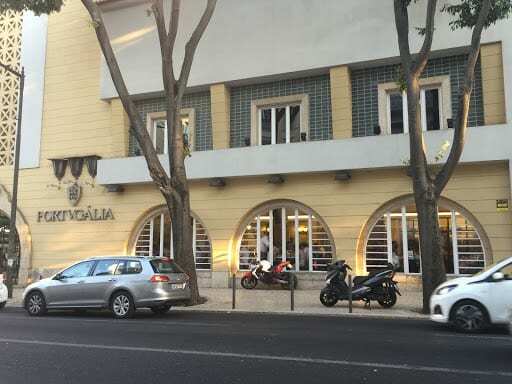 Thank you, Tiago, for recommending Portugalia. There’s no denying that we’ve been eating a lot. 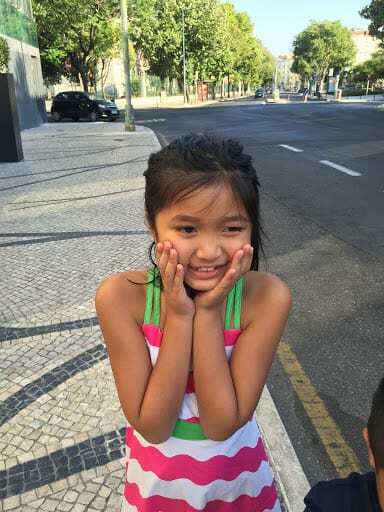 I forgot to mention that during our Uber ride with Tiago, we told him how we’re enjoying our visit, so many historical sites, lots of places to visit, lots of walking….and then I heard Evan in the background, “and a LOT OF WALKING!” Yep, that’s my Evee! So around 8pm, we decided NOT to take Uber but to again give us a chance to wander aimlessly. 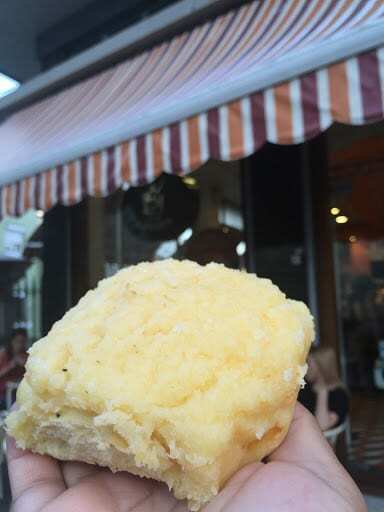 We did decide to walk towards the hotel though, and by walking, it meant a chance to stop and eat a couple of Pastel De Natas from Monte Rei, and a Pao de Deus from another local bakery. 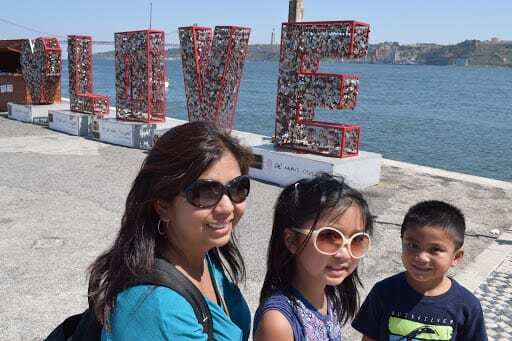 All in all, we walked for about 20 minutes, leisurely, casual walk, enough fun for all of us on our first full day in Lisbon. Okay, so before I cap off the blog, me continue with my points-earning discussion. Not necessarily all true. 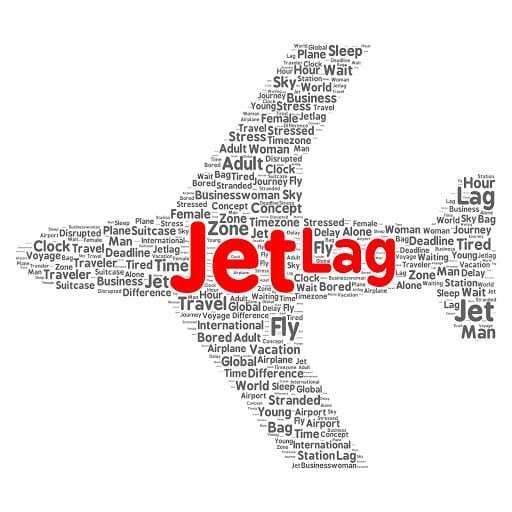 Well, if I relied solely on my points earned from my business trips, I’d have earned a couple of free hotel nights stay and possibly a free flight somewhere. So I had to find out how else to earn points, and that’s when I learned about points earned through credit card sign up bonuses. Wait! I have to pause for a second. I have to put this out there. This is not about you opening up a credit card, or different credit cards, spending, and then paying your minimum monthly payment, or missing your payments. Nope. This is not for those types of cardholders. Sign-up with a credit card that offers lucrative bonus. Meet the minimum spend (typically $1,000 to $3,000 total within 90 days). Make sure you pay your credit card bill in FULL on or before its due date, otherwise you’d have wasted the benefits if you pay the ridiculous interest rates. Once your minimum spend requirement is met, you have a choice to keep using the credit card, or setting it aside. Before the end of the 1st year of having the card you realize the card is worth or not worth keeping, make that decision before the annual fee is charged. Most cards typically waive the first year’s annual fee. 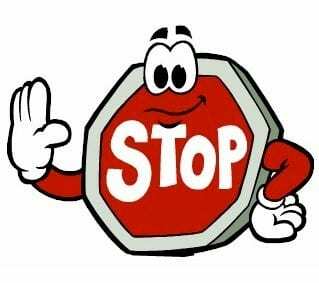 There are credit card companies that will come up with creative ways for you to not feel the pain of paying for an annual fee by giving you a credit and/or more points. It happened to me. Disclaimer: I’d like to reiterate that opening up a credit card/s to get in to this points-earning game is not an invitation for you to spend on things you don’t need. So caveat emptor. Use the card appropriately in order to meet the minimum spend.